Pioneer launches SX-S30DAB network receiver in UK | What Hi-Fi? The Pioneer SX-S30DAB network receiver can support streaming services such as Spotify and Tidal, and play hi-res music files via its wireless connectivity or USB input. 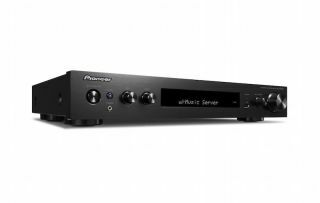 Pioneer's new SX-S30DAB two-channel network receiver, having been already available in Europe since September 2016, has been launched in the UK, priced at £480. For that, you're getting 85 watts per channel at 4 ohms, powered by Class D amplifiers. The SX-S30DAB can support a number of wireless streaming services: Spotify, Tidal, and Deezer. You can also play hi-res music via wi-fi, Bluetooth, or Apple Airplay. It's also expected to have Google Cast and FireConnect multi-room audio functionality later in the year, after a firmware update. If you prefer wired connections, this network receiver has you covered too, with four 4K UHD HDMI inputs and one HDMI output, an optical input, and a USB port able to deal with 24-bit/192kHz resolution music files. There's even a moving-magnet phono stage if you're keen to engage with the vinyl resurgance. No word yet on whether Pioneer's future products will include cassette tape decks, though.